Last updated on May 8th, 2018. 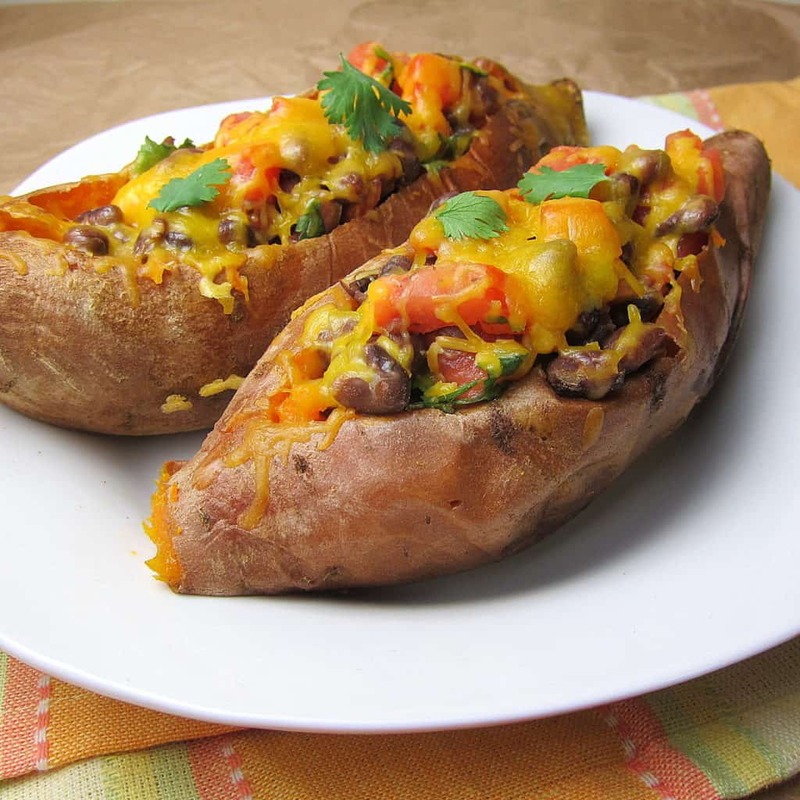 The perfect vegetarian dinner – Chipotle Black Bean Stuffed Sweet Potatoes! A delicious and healthy recipe that is sure to please everyone. The spicy black bean stuffing is a perfect complement to the roasted sweet potatoes. It’s been a while since I posted, and I am so glad to finally share this super tasty recipe for Chipotle Black Bean Stuffed Sweet Potatoes. 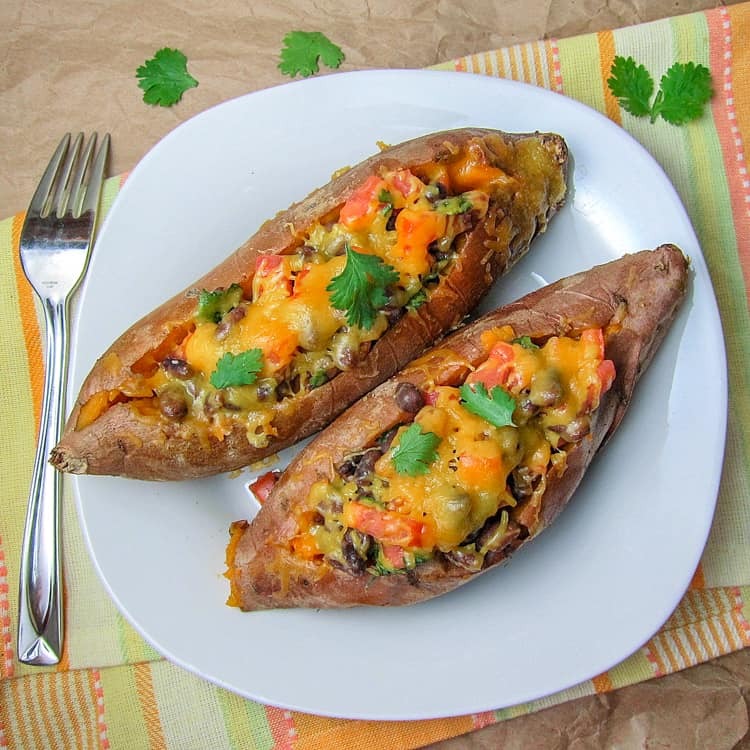 These are sweet potatoes that have been roasted until they are tender, and then stuffed with a delicious mix of Black Bean, diced tomatoes, cilantro, and chipotle pepper. And then everything is topped with cheese and roasted until melty cheesy perfection. I just LOVE the combination of sweet potatoes with spice – especially smoky chipotle. I think the two flavors go so well together, which is why I am in love with this dish. This stuffed sweet potato recipe is great for feeding a crowd – it wouldn’t take any longer to make this for 8 people then for 4 people. Just throw 8 sweet potatoes in the oven to roast and double the filling. Even though the total cook time for this recipe is one hour, the recipe is pretty hands-off. It takes just a couple of minutes to throw all the ingredients together in a bowl. Most of the cook time is just the sweet potatoes roasting in the oven, with no attention required from you. We make this dish a LOT at home. Sometimes we switch it up a little by adding chopped bell pepper or fresh corn. I’d love to hear how YOU would prepare this Stuffed Sweet Potato recipe! Leave me a comment below and let me know. This recipe may contain affiliate links. Preheat oven to 400F. Pierce the sweet potatoes with a fork a few times and bake 45-55 min at 400F until fully cooked and fork-tender. Baking time will vary depending on the size of your sweet potatoes. Remove from oven and allow to cool while you prepare the filling. In a medium bowl, combined the rinsed black beans, diced tomato, chipotle powder, salt, garlic powder, lime juice, and cilantro. Mix well. When the sweet potatoes are cooked, carefully carve out a canoe-shaped hole in the sweet potato, scooping out the flesh with a fork (the potato will be steaming hot! Be very careful!). Use two forks to pull at the sides to 'widen' the potato a bit to make more space for the filling. Spread the bean mixture equally between the 4 sweet potatoes. Top each with 1/4 of the shredded cheese. Bake at 400F for 3-5 minutes, or until the cheese is melted. Allow to cool for a few minutes before serving. So glad to hear you had a chance to visit India,it must’ve been a lifetime experience! We also love the Indian spices ourselves (the cumin-coriander-turmeric powders are a staple in our household), and buying them fresh from the source, they are bound to taste amazing! We can’t wait to see the rest of your posts! Hope you had an amazing Christmas and Chanukah! Wow this sounds delicious! Perfect for a healthy and easy week night meal. And since I’m from Texas, these Southwestern flavors are right up my alley 🙂 Thanks for sharing!